Welcome to Wagesofwins.com. The book is now finished. Stanford University Press tells us it will ship on May 8. Soon after that, everyone should be able to place an order. If you can't wait, you can pre-order today from a variety of places. While we all wait we have the website and this blog. 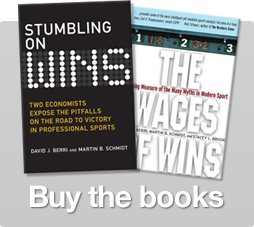 Our book details how the numbers generated in sports contradict many beliefs people profess about sports. Fortunately for us, examples fitting the theme of our book are offered frequently. Unlike an academic journal article, which gives us the chance to publish a comment several years after an event takes place, the blog will give us the opportunity to comment a bit more quickly. So look forward to daily comments, although none until tomorrow. Setting up a website and blog is enough for one day. 3 Responses to "Welcome to Wages of Wins Blog"
Both the website and the blog are very nice. Great job!